When the old church at the ceme­tery in Hostert became too small for the grow­ing pop­u­la­tion, a « new quar­ter » had been brought to life between the years 1857 and 1859 in the vil­lage with the con­struc­tion of the new church St. Jean. 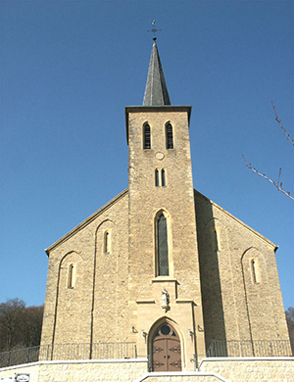 The mon­u­men­tal build­ing sur­mount­ed the new quar­ter with its Place Grand-Duchesse Char­lotte and three oth­er build­ings, built in form of a hemi­cy­cle around the church: these were the old school, the fes­ti­val room for asso­ci­a­tions and the town hall. Stairs are lead­ing to the impres­sive neogoth­ic church with its sin­gle tow­er, con­struct­ed on the height of the quar­ter. The non plas­tered main build­ing in its yel­low sand­stones is divid­ed into 5 axes, dec­o­rat­ed with the typ­i­cal point­ed ark goth­ic win­dows and a polyg­o­nal cho­rus on its West­side. 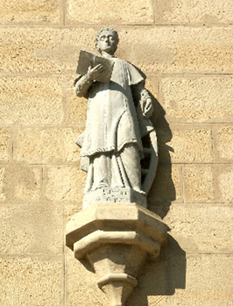 In 1871 the stat­ue of St. Cyr­i­ac had been put out­side over the entrance gate of the St. Jean church. 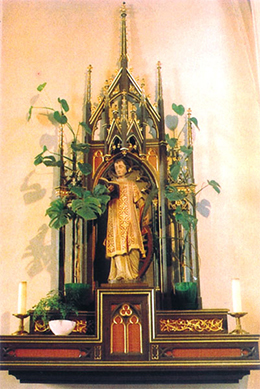 Before that date the gold­en sculp­ture of the Saint was placed at the right side of the church’s inte­ri­or, where he is still enshrined. The region­al­ly famous parish fair day of Hostert (“Hostert Day”) goes back to the times when peo­ple from all over the region did the pil­grim­age to Hostert in hon­our of St. Cyr­i­ac. 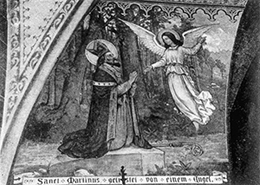 Two inte­ri­or fres­cos, illus­tra­tions of the lives of St.Martin and the beat­i­fied Schet­ze­lo had unfor­tu­nate­ly been lost because of paint­ing works. The beat­i­fied Schet­ze­lo has since ever been dei­fied in the munic­i­pal­i­ty of Nieder­an­ven. He lived at the 12th cen­tu­ry and spent 14 years of his life all alone in a grot­to in the Grünewald for­est, under the most poor and Spar­tan con­di­tions. 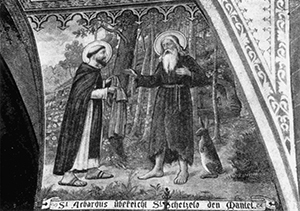 The old paint­ing shows the cis­ter­cien­sian monk Archadus, offer­ing a coat against the cold to the pious her­mit, ordered by the abbot of Cler­vaux. The grot­to where the her­mit lived still exists today and has become a place of ven­er­a­tion over the years. The feast of the beat­i­fied Schet­ze­lo is tak­ing place every year on the sec­ond Sun­day of the month of August. 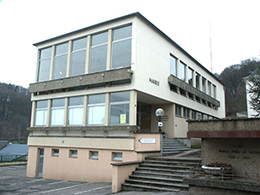 The cul­tur­al cen­tre Jean-Pierre Glo­den, built in 1970, had the func­tion of the town-hall until the year 2006. Until 1983 the local school was also locat­ed in this build­ing. 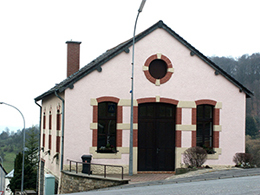 The new town hall was con­struct­ed in Ober­an­ven and opened in Jan­u­ary 2006. The build­ing was demol­ished in 2013 to give way to a project of new hous­es. The old school build­ing, where once hold­ing at the same time the post office and the town hall, is today the main room for asso­ci­a­tions and the office of a bank branch. 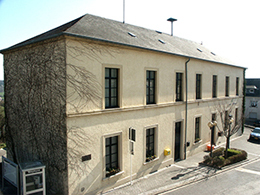 On the first floor you can find the office “Geschichts­frënn”. This build­ing was reniewed in 2013 and serves today as offices and con­fer­ence facil­i­ty for the local asso­ci­a­tions. The old asso­ci­a­tions’ room, today the meet­ing room of the con­sis­to­ry.